BucketSizeX and BucketSizeY contain the number of blocks that can fit in the bucket horizontally and vertically. 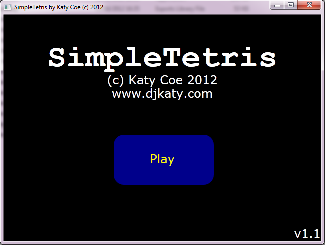 SimpleTetris::BlockSize is the pixel width and height of each block. LeftSide and TopSide contain the top-left x and y positions of the bucket. 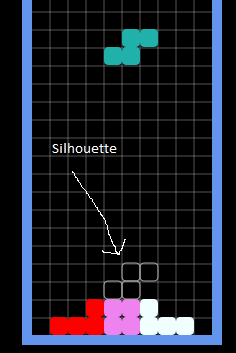 Modern Tetris implementations include a “silhouette” of the current piece. This is a greyed out rendering of the piece showing where it will land if left to fall in its current position. The silhouette of a piece shows where it will land if it continues to fall from its current location. To draw the silhouette in the right place, there are a couple of options. We could visualise the piece at the bottom of the bucket and move it up one row at a time until it is not touching any other pieces. A quicker-to-implement but less resource-efficient method is to simulate the piece falling until it can go no further. This is the approach I have used here. The current position of the piece is remembered, the simulation run, the piece drawn in outline and the original piece position restored. MoveToBottom() is exactly the same function that is called when the user presses the Fast Drop button when playing (which sends the piece immediately as far down as it will go). The arguments to Draw specify that we want the piece drawn in a silhouette outline. DrawSilhouette() is then called from the main scene drawing function on each frame. The else if is important here. If we had just used another if without the else, the game could never be paused as the pause state would be reverted as soon as it was set. Note that we still want to render the actual game (the bucket, shapes etc.) even when the game is paused, so we don’t check for the pause state when drawing the rest of the game. Note also that printing the pause message must come after the rest of the scene has been drawn, otherwise it will get partially obscured by other drawn objects. The prototype version of Tetris started the game immediately when you ran the program, and the only way to retry when the game was over was to close the program and re-open it. This is not cool! Games should have menus and game over screens where applicable, and we achieve this by adding two more game states: Menu and GameOver. The first 5 lines draw the title and copyright messages. The middle 2 lines draw a box that the user can click on to start a new game, and the last 2 lines draw the version number in the bottom-right corner of the screen. Basic clickable button: the background colour of the Play button changes when the mouse hovers over it. Clicking on the button causes the game to start when the left mouse button is released. Note that mouse actions are ignored unless the game state is currently Menu. The code checks if the mouse pointer is within the Play button or not and sets its background colour appropriately. Once again the code ignores the mouse unless we are in the menu, checks if it is inside the Play button and calls a new function newGame() if the left mouse button has been released. Note we prefer to wait for the user to release the mouse button rather than starting the game as soon as they press it for ergonomic reasons. We didn’t have to worry about re-initializing everything needed for the game when it could only be played once, but now we need to make sure everything is correctly prepared at the start of each new game, so we abstract this behaviour into newGame(), and remove it from the initial setup of the program, waiting instead until the user clicks on Play. // If the new shape is already on another shape, it's game over! Note that we have to provide feedback to the user how the game ended, so to this end we still keep the new piece “in play”, and simply move it upwards beyond the top edge of the bucket until it is no longer colliding with anything. This allows the player to see visually that the bucket has overflowed. Remember, the game board is still drawn even in the game over state. Since the game essentially does nothing except draw the game board and game over message without updating any object positions or taking other user input once the game over state is entered, this essentially freezes the game until the user presses space, then causes it to go back to the main menu. The Shift / Hold mechanic of modern Tetris allows the player the option to switch the current falling piece for the piece shown in the Next Piece box. They can only do this once at a particular point, then may not use the switch feature again until the current (switched) piece has landed. First we need to track if the user has switched out the current piece or not. We add a boolean variable held and set it to false both in newGame() and newPiece() (the latter is called when each new piece besides the very first one in a game comes into play). Performing the shift is conceptually simple – just swap which piece is in play – but in reality it is more problematic. First, the new piece must be in the same place in the bucket as the old piece. This not only means it has to be moved down to wherever the old piece was, but collision checking must be done and the piece moved around until it fits. The first two lines make the left-hand side and bottom side of the two pieces line up in the bucket. This ensures that the switched piece will not be any lower down (but its top edge may be higher up) in the bucket than the original piece. It also ensures that it will not be off the left-hand edge of the bucket. This leaves the possibility that the switched piece might be off the right-hand side of the bucket. The next line of code moves the piece left so that its right-hand edge is aligned with the right-hand edge of the bucket, if this is the case. Finally we check to see if the switched piece is now sitting on top of any pieces already in the bucket, returning true if the piece can be placed and false if there is a collision. Whether or not this matches how modern Tetris is actually implemented I don’t know, but it seems to work in a fluid way that feels natural. Before swapping the pieces, we try to conceptually move the piece in the Next Piece box to be aligned with the current piece. If this is not possible because of a collision, nothing happens. Otherwise, held is set so the user can’t switch again until another piece comes into play, the pieces are swapped and the fall timer initialized on the new piece. // The Y position of the shape must be such that the first solid block in the 4x4 grid appears on the top row of the bucket! This completes the implementation of the shift/hold mechanic. newFills contains the number of lines that were filled (cleared) when the piece being processed landed. I hope this gave some insight into how to add certain basic features to your games. Next time we will look at a modern solution to high score tables that is applicable to most generic games.